Literary Wanderings hit the road this week. Me, Marc (my fiancé), and Bella (our fearless – ok, mostly fearless, Great Pyr and constant companion) are trekking across the country from Louisiana to Anchorage on an epic road trip to see the country and learn a little along the way. Our first stop was in Allen, Texas at my brother and sister-in-law's home. Bella loved (well, was slightly overwhelmed at first with) all the attention from the little dogs in their house, and they soon made friends. Next stop: Kenton, Oklahoma. The drive was hot, but beautiful! 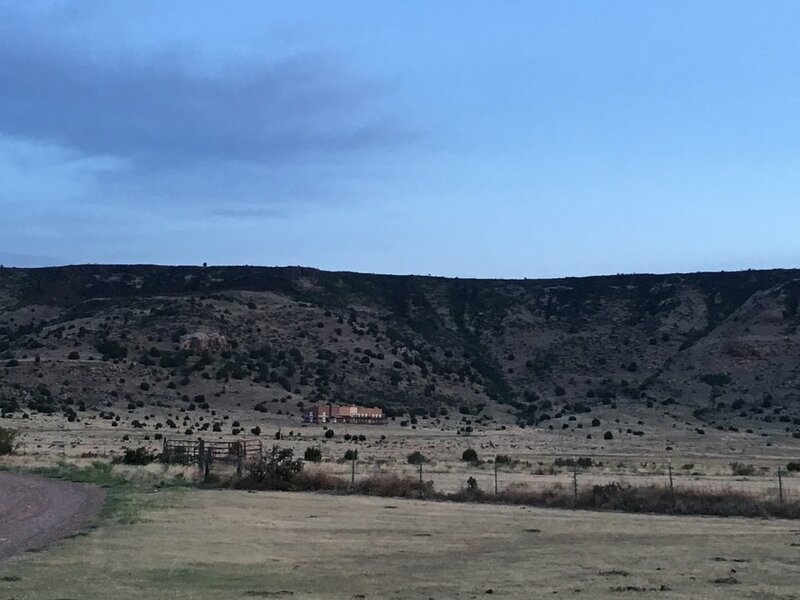 We wound our way through the rocky, dusty Oklahoma back roads to find a hidden gem, Black Mesa Bed and Breakfast, a working cattle ranch with the highest point in Oklahoma, the Black Mesa at 4,973 feet, standing guard over the outcroppings of the 1910 ranch house and separate bunkhouses on the property. When I called to book the room, Kara, the owner's niece, answered the phone and explained that we would be, "at least 45 minutes from the nearest loaf of bread," so we decided to stop in Amarillo to pick up steaks and salad makings on the way. What an amazing evening ensued. 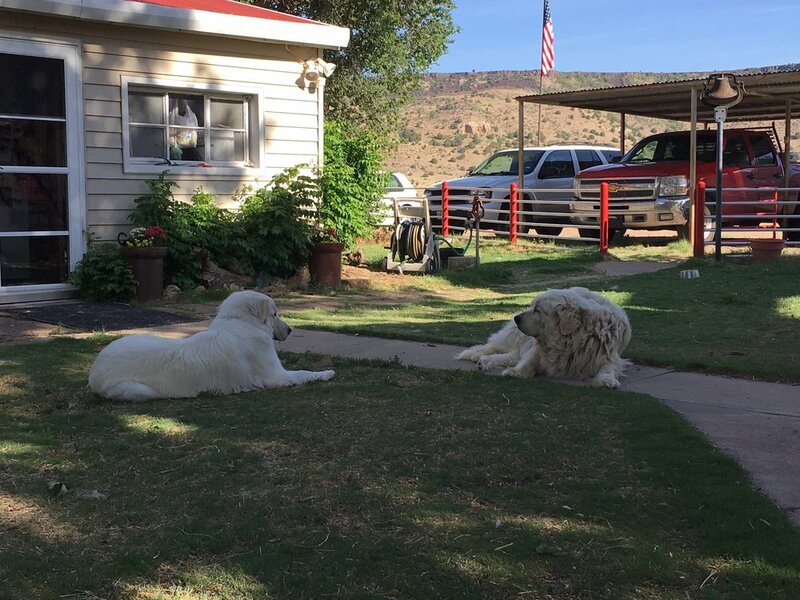 Kara and Loco, the ranch dog and fellow Great Pyr, greeted us with smiling faces and wagging tail. The grill was already set up for us and the wrought iron patio table set with plates, utensils, and wine glasses. Marc and I enjoyed one of the best meals we've ever had. Perfectly pink-in-the-center steaks, grilled garlic bread, and a homemade garden salad expertly paired with a glass of red wine as we watched Bella chase birds and rabbits, and guard the property with her new friend, Loco. Being a ranch dog is a tough job (check out the photos of these two hard at work). Later that evening, I stopped by the big house to say goodnight and plan our breakfast time. I happened to mention to the owners, Vicki and Monty, that I was a teacher. They both chimed in offering stories from their own family histories and photos of the ranch through the decades. Monty explained that while both of his parents were from the Oklahoma panhandle, they moved to California during the 1930s to escape the dust storms and economic hardships of the area in search of work. They later moved back to Kenton in the 40s when they purchased the property where he and his wife, Vicki, currently reside, to raise their family and work the land as a cattle ranch. My dad and I raised Hereford cows and I can remember being out there with him checking on those cows when one of the worst dust storms we've ever seen blew in. I was about ten years old and we ran to a nearby cave to get out of it. You couldn't even see your hand in front of your face. This dust was black. Black dirt everywhere. When we got home that evening, I remember seeing the cake of fresh butter my mother recently made and placed on the dinner table totally black with the dirt and dust. If you teach the Great Depression of the 1930s using Karen Hesse's Newbery Medal Winning novel, Out of the Dust, check out this resource for student-led research activities to enhance your students' understanding of how the depression and dust storms affected the people of the Oklahoma Panhandle. Also, the Library of Congress Primary Source Set: The Dust Bowl has numerous photos, audio, maps, and more to enhance your lessons. Finally, if you are looking to gain more accurate background information on the Dust Bowl region during the 1930s, The Worst Hard Time by Timothy Egan has been highly recommended by the locals for teachers (and anyone interested in history). Like this post? Sign up here to receive a weekly dose of empowerment, inspiration, and encouragement through adventurous student-centered learning activities, self-care tips, and roadmaps to creating more wealth and freedom. DISCLAIMER: At this time, I do not receive any income from the mention of products or services. Any products or services listed are strictly my own recommendations based on my own experiences and opinions.